Even before opening the lush and deceptively textured cover of Ann Cefola’s Free Ferry, the reader is alerted to the collection’s investigation of and rumination on instability vs. stability, ephemerality vs. longevity. The smooth, matte cover depicts summer-clothed children in play against an abstract sylvan background; patches of various greens and browns blot together, suggest the fecundity of a healthy and vibrant natural world. Yet ominous, almost seething splotches of white quickly interrupt this natural palette as the eye is drawn up the cover. In this imagery’s juxtaposition arises an unnerving set of questions: which of the two forces is growing and which is decaying? 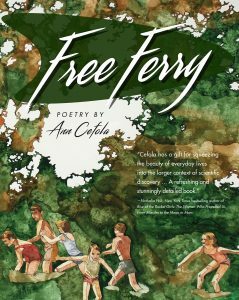 Free Ferry, which is Cefola’s fifth poetry publication, concerns the balance between these two forces, growth and decay, in the context of nuclear physics, ultramicrochemistry, domestic life in the mid-20th century, and Greek mythology. The collection structures itself into two (more-or-less) straightforward narratives: there is the story of Eurydice, Orpheus, and their nuclear (pun definitively intended) family in blossoming suburbia, told often from the young, never-named daughter’s perspective; and there is the story of a character referred to as “Dr. –,” one of the scientists present at the first weighing of the newly isolated element plutonium in the early 1940s. Like the design of the collection’s cover, the two narratives are placed in juxtaposition in terms of their structures and scopes: the story of Eurydice, Orpheus, and their family during a specific and limited moment in their lives is told across vivid and hearty chunks of experience in anywhere from six line to two page poems while Dr. –’s life-long narrative occurs concisely condensed in the literal margins, with the text that details Dr. –’s tersely rendered emotions and experiences running as a continuous footer to the poems of Eurydice, Orpheus, et al. Thus, the collection reads as both cohesive and particular all at once. Which explains Cefola’s choice to provide a child narrator for most of the collection’s poems (and to dedicate the collection overall “to Mnemosyne,” the Greek’s personification of memory). This childlike voice, found in Cefola’s often assonant- and end-rhyme-rich as well as idiosyncratically agrammatic and clipped diction, invokes nostalgia and triggers the deep well of memory for a time as immediate and fleeting as the recent lived historical past. As memory plays its stories back in pieces, so do the disparate yet connected moments and images emphasized by this hyper-observant speaker. And it’s not just the natural world that is morphed askew: at the salon, this speaker notices “[h]air dryers like beehives burn the scalp, and sinks, / like guillotines, indent for necks” (14). At home, technologies like television, clock radio, even radiators and concentrated dish detergent pervade, entrance, and hypnotize: “ . . .[e]ven when [the television picture is]gone, / screen gray-green, [the speaker]can’t stop [watching]” (27). The proximity of these manufactured objects warps and mythologizes the speaker’s (and her family’s and community’s) relationship with the natural world. Nuclear missiles are likened to the “television, car and phone . . . / They’re part of home” while “Mrs. M’s backyard slope . . . [n]ot far from street . . . [becomes]heaven we know” (52; 29). But even as the modern world of weapons-grade plutonium and Cold War hysteria grows, there is a tenderness in this world, this family that does not decay. The daughter sees love, comfort, and care in Orpheus’ “[s]lipping [his]arm about [Eurydice’s] waist, like water eases down a glass of milk” (45). Cefola’s constant allusion to Greek mythology and archetype only accentuates the cyclical mystery of existence’s grand paradox: as soon as we live and grow, we contemporaneously begin to die and decay. One of Dr. –’s last lines claims his death is “[n]ot fission but fusion” (55). But in fission there is fusion and vice versa; all energy and matter is conserved, carried on, though changed. As Cefola so affectingly states in the final lines of “passage,” Free Ferry’s final poem: “our iridescent journey” is given over to death’s river, is “by the river’s own waves erased” (56). Grace Gardiner is a recent graduate of the University of North Carolina at Greensboro’s MFA Program and a former poetry editor for The Greensboro Review. Her work has appeared in The Adroit Journal, burntdistrict, and Forty Eighty-Five. In the fall, she will begin pursuing her PhD at the University of Missouri, Columbia.